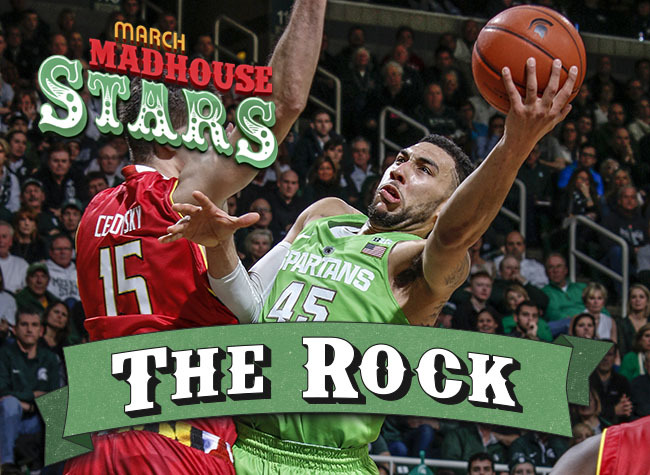 Denzel Valentine knows his Michigan State basketball history well. Not only did he grow up a 15-minute drive from the East Lansing campus, but his father, Carlton, was also a star player for the Spartans in the late 1980s. As a boy, Denzel and his older brother, Drew, would often linger by the Spartans' locker room, hoping for an autograph from star players and future NBA pros like Mateen Cleaves and Morris Peterson. So it was not lost on him that when he recorded a triple double last November against Kansas — scoring 29 points, grabbing 12 rebounds, and dishing 12 assists — he was joining a prestigious group within Michigan State's proud history. Only three Spartans players had ever done that before: Charlie Bell, Warriors forward Draymond Green, and Hall of Famer Magic Johnson. In the hallway after the game, Michigan State's athletic director handed Valentine a cellphone. On the other end was none other than Johnson himself. While that moment was the high point of Valentine's regular season, it certainly wasn't his only big performance. Despite having to work his way back from mid-season knee surgery that kept him out of four games in late January, Valentine was leading the Spartans with 18.4 points and 6.6 assists per game, and he was second on the team with an average of 7.9 rebounds. His combination of ability and court intelligence makes him the kind of player who can thrive in the madness of March. Valentine did not arrive at Michigan State as a star. He was an excellent player at Sexton High in Lansing, where he won two state championships while being coached by his father. He nearly averaged a triple double as a senior, combining his 6'5" height with the ballhandling skills his father taught him and the passing vision he developed playing quarterback in youth football leagues. But in the summer before 11th grade, he still had not proven to Spartans coach Tom Izzo that he was good enough to play for his dream school. Eventually Denzel asked Izzo what it would take for him to be offered a scholarship. Izzo told him that he had to prove himself as an outside shooter. "It kind of hurt my feelings," Denzel says now. "But he was right." Denzel responded by practicing his shooting for so long that his father had to force him to leave the gym. A short time later, Denzel hit seven three-pointers in an AAU game while Izzo was in attendance. When Izzo offered the scholarship, Denzel accepted. "I was like, Wow, I can't believe it's happening," Denzel says. Still, there was plenty of work to be done. Valentine had often confused defenders in high school with flashy, no-look passes. But at the college level, those plays often resulted in turnovers. As a freshman, Valentine averaged nearly as many turnovers (2.0 per game) as assists (2.4). Izzo joked that instead of Magic Johnson, Valentine looked more like Tragic Johnson. "He would be on me every day about keeping it simple," Denzel says. "Go for singles, not home runs." In the three years since, Valentine has become a more direct, accurate passer. And as his game has grown, so has his role, from a backup to a starter to the centerpiece of the entire team. Last season Valentine experienced another breakthrough: His first trip to the Final Four. After beating Louisville in the Elite Eight, Denzel was able to celebrate with his family. Drew served as one of the Spartans' graduate managers, and when the final buzzer sounded, the brothers locked one another in a hug. Their father ran onto the court and hugged Denzel, who wears the same number that Carlton wore at Michigan State. The list of Spartans to reach the Final Four is long (State has reached nine), but only two squads have won national titles: Johnson's team in 1979, and Cleaves's in 2000. "You can say you went to the Final Four," Valentine says, "but when you come back to the reunion, you hear all these other people saying, 'Me too.'" But if he's able to help the Spartans take that last step and become champions? "I'll be in a separate category," he says. "That would be a lifetime achievement."